Home Crime UPDATE: Was The Golden State Killer a Cowboy? Nearly a year after Los Angeles magazine published “In the Footsteps of a Killer”—Michelle McNamara’s March 2013 feature about one of the most violent criminals in California history—theories about the Golden State Killer’s identity and whereabouts are still swirling. I have a question about the knot. Has it been considered that the suspect is a cowboy or ranch hand? 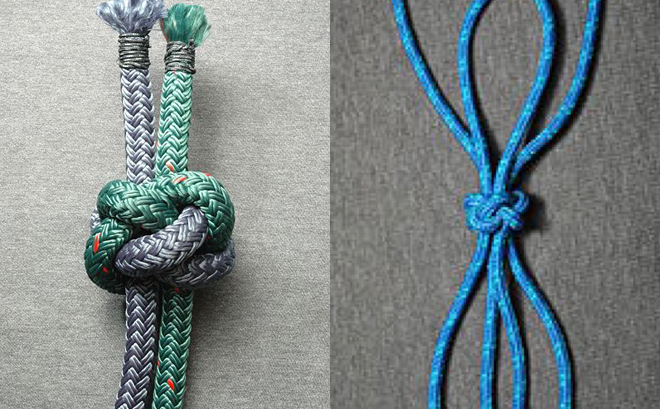 The images of the knots tied do not give enough detail but the images look to have multiple knots on a single strand. A ranch hand specifically a Mexican or Hispanic one would have heard of a hackamore or rope halter that uses a single rope to create the halter. Also, the rope halter uses a fiador knot, which looks similar to the diamond knot. That’s a great insight about the similarities between the fiador and diamond knots. I wasn’t familiar with the fiador, and was struck by its resemblance to the diamond (see above). To refresh readers, the diamond knot is a somewhat unusual knot with mostly nautical and decorative purposes. The Golden State Killer used the diamond knot to bind Charlene and Lyman Smith, who were found bludgeoned to death with a fireplace log in the bedroom of their Ventura home on March 16, 1980. The Internet sleuthing community has speculated about the meaning of the diamond knot and what it might tell us about the killer, but case investigator Larry Pool (who is now retired from the Orange County Sheriff’s Department), played down its importance to me. “It only tells me he had the dexterity to tie that kind of knot under some degree of stress,” he says. The possibility of a cowboy or ranch history is interesting though, as some other clues have also suggested that background. For example there’s compelling evidence that the Golden State Killer began his crime spree in April 1974, in Visalia, an agricultural town (grapes, olives, livestock) in California’s San Joaquin Valley about 200 miles southeast of Sacramento. From roughly April 1974 to late 1975, an unidentified offender known as “the Visalia Ransacker” repeatedly broke in and vandalized homes in four residential neighborhoods. His M.O. matches the Golden State Killer’s in many ways. In September 1975, a man believed to be the Ransacker attempted to abduct a teenage girl; he murdered her father in the process. The Ransacker disappeared shortly thereafter. A couple of months later, the Golden State Killer started attacking in Sacramento. Other similarities noted by Internet sleuths include the Golden State Killer’s command whispering, which is also used by people that work regularly with horses. Ditto goes for the military bearing many surviving victims noted. Others have looked into the correlation between attack dates and the schedule for horse shows at Cal Expo in Sacramento and Del Mar in Southern California. One sleuth even noted that the Golden State Killer once stole 850 pennies from a victim; Pennies, which were mostly made of copper in the ‘70s, were used in horse water troughs to cut down on algae. I doubt the Golden State Killer was working regularly with horses during his crime spree in Northern California, as one of his victims likely would have reported that smell. But it’s possible he had experience as a ranch hand, or grew up around the animals. Unfortunately, as with so much in this case, the possibility remains just that, a curious hint in the “maybe” column that, hopefully, will soon be known for sure.